Flames in Lemon Grove Sunday damaged power lines, trolley rail ties, a fence and the eaves of some houses, according to Heartland Fire & Rescue. The fire broke out about 5 p.m. near the Lemon Grove Trolley Station in the 1500 block of San Altos Place, department spokesman Sonny Saghera said. Initial reports were that palm trees were on fire, Saghera said. Responding firefighters — who came from Lemon Grove, Le Mesa, San Diego and San Miguel — found two palm tree crowns ablaze near a house. 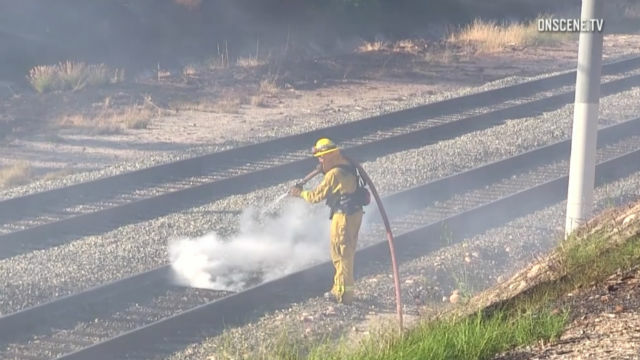 The fire the spread down to the trolley tracks and into nearby grass, threatening about 20 homes, he said. A water-dropping helicopter was used, and firefighters knocked down the flames in about 40 minutes. Flames damaged power lines and railroad ties to the trolley, a nearby fence and the eaves of some houses, Saghera said. The trolley was temporarily shut down because of the fire, which burnt an area amounting to about 130 yards in total. The cause of the fire was being investigated by the San Diego County Sheriff‘s Bomb and Arson squad, Saghera said.